IBM has integrated multiple optical components alongside electrical circuits using 90nm semiconductor process technology. 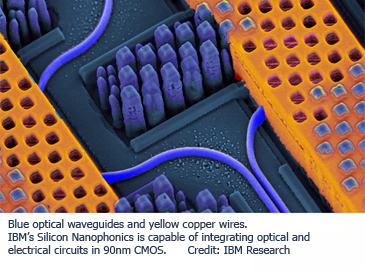 Essentially, IBM has successfully added a variety of silicon nanophotonics components, such as wavelength division multiplexers (WDM), modulators, and detectors, alongside CMOS electrical circuitry using a conventional semiconductor foundry. IBM’s CMOS nanophotonics used transceivers exceeding 25 Gbps per channel. IBM said its integration is capable of feeding a number of parallel optical data streams into a single fiber by utilizing compact on-chip wavelength-division multiplexing devices. The ability to multiplex large data streams at high data rates will allow future scaling of optical communications capable of delivering terabytes of data between distant parts of computer systems. In October 2012, IBM announced a breakthrough in building a semiconductor using carbon nanotubes instead of silicon. IBM researchers created a device consisting of more than ten thousand working transistors made of nano-sized tubes of carbon. Standard semiconductor processes were used to fabricate the device. IBM has previously demonstrated that carbon nanotube transistors can operate as excellent switches at molecular dimensions of less than ten nanometers – less than half the size of the leading silicon technology. Telefónica Global Solutions will deploy the Cisco CRS-3 and ASR 9000 Series routers for enhanced capacity, high resiliency, and robust IPv6 support. Financial terms were not disclosed. Telefónica's network connects more than 100 locations in more than 60 cities and 40 countries connecting the main cities of Europe, Latin America, the United States and Asia. 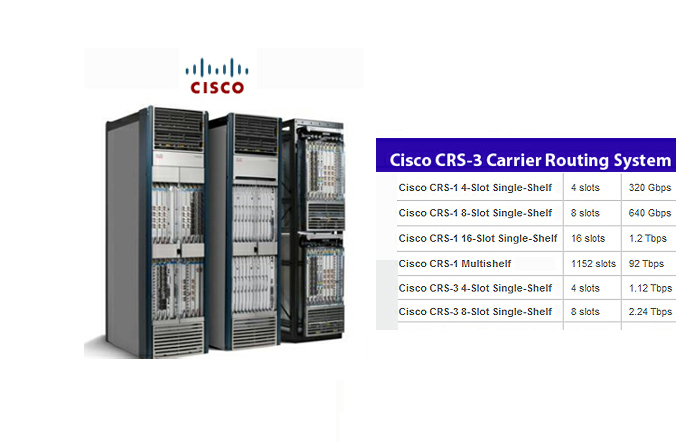 Cisco said its CRS offers the possibility of future upgrading capacity for its core network with upto 400 Gbps per slot capability, high resiliency, and a cost-effective intelligent core solution to improve the return on investment for its core network. 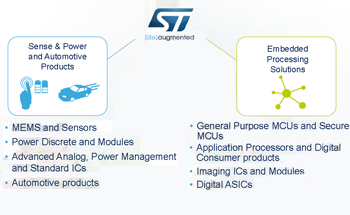 STMicroelectronics unveiled a new corporate strategy under which it will exit the ST-Ericsson partnership and the wireless broadband market, choosing instead to focus on sensors and embedded processing. “Our new strategy is centered on leadership in sense and power and automotive products, and in embedded-processing solutions. Our specific focus is on five product areas: MEMS and sensors, smart power, automotive products, microcontrollers, and application processors including digital consumer," stated Carlo Bozotti, President and CEO of ST. The company will be organized in two product segments: Sense & Power and Automotive Products; and Embedded Processing Solutions. Sense & Power includes MEMS and sensors, power discrete and advanced analog products; as well as Automotive Products, including powertrain, safety, body and infotainment. ST said it expects both product segments to be profitable and to generate cash. In particular, Embedded Processing Solutions will turn to profitability leveraging on a stronger product and technology focus, expanded customer base and manufacturing synergies between microcontrollers and digital products. For its part, Ericsson said it is negotiating with ST concerning a suitable outcome of their ST-Ericsson joint venture. Ericsson believes that the modem technology, which it originally contributed to the Joint Venture, has a strategic value for the wireless industry, and that a successful market introduction of new LTE modems is needed in the market. 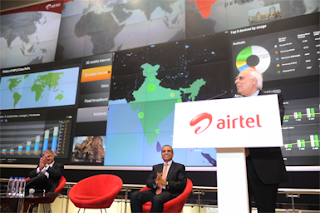 Bharti Airtel has installed a 3600-square-foot video wall powered by Nokia Siemens Networks’ dashboard solution at its new Network Experience Centre in Manesar near Gurgaon, India. The wall monitors and analyzes the various aspects of the operator’s entire network operations, and presents them in a unified video view. Pica 8, a start-up based in Palo Alto, California and Beijing, China, introduced its SDN reference architecture, including a physical open switch, a hypervisor virtual switch and an SDN controller leveraging the OpenFlow 1.2 standard. Unlike earlier SDN entries that target enterprise data centers, Pica 8 has set its sights on data centers for cloud, portal and service providers. Pica8’s PicOS supports OpenFlow 1.2, it also integrates with the Ryu 1.4 OpenFlow controller, designed by NTT Laboratories specifically for SDN applications that service providers need. The company's first physical switches pack up to 48 port 10 GbE SFP+ ports with four 40 GbE QSFP+ or 16 10 GbE QSFP+ uplink ports. Pica 8 is headed by James Liao, who previously led product strategy for switching and data center products at original device manufacturer Quanta. Alcatel-Lucent will provide Rio Tinto with an end-to-end private 4G LTE network, comprising radio access network (RAN) products including distributed eNodeB base stations operating at 1800MHz, as well as its Evolved Packet Core and Mobile Backhaul capabilities using the 9500 Microwave Packet Radio. Alcatel-Lucent is also providing its 1830 Photonic Service Switch (PSS)and its 5620 Service Aware Manager (SAM) network management solution, as well as a range of professional services. 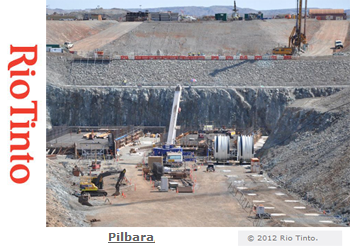 Rio Tinto is a leading international mining group. The LTE network will be deployed in the north of Western Australia, where Rio Tinto is engaged in the West Angelas mine in the Pilbara. Sean O’Halloran, President and Managing Director of Alcatel-Lucent Australia said: “Rio Tinto is at the cutting edge of digital service innovation and deployment, driving new levels of productivity and efficiency. This is the first deployment of its kind and is a result of a collaborative and interactive process with Rio Tinto. It will provide a strong foundation for any future rollouts of private LTE networks to enhance operations at other locations." Huawei will invest EUR 70 million over a five-year period to establish a research and development (R&D) center in Helsinki, Finland. The facility initially will hire 30 employees and target its research on software development for smartphones, tablets and rich-media devices, optimizing the user experience of existing operating systems such as Android and Windows Phone 8. 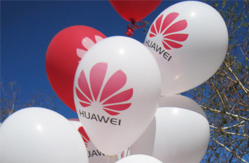 Huawei already operates a modem and technology design center in Sweden and a user interface research center in the United Kingdom. Klarna, a Swedish e-commerce company that provides payment services for online storefronts, has built its new data center based on Juniper Networks' QFabric architecture. 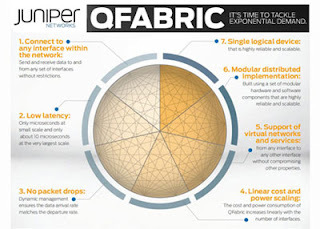 Juniper confirmed that Klarna has deployed a QFX3000-M QFabric System, a high scale network fabric, to ensure the company can manage increased demand for capacity, scalability and flexibility as the volume of online payment data grows by significant amounts each month. The QFX3000-M delivers extremely fast server-to-server speed for Klarna, with 63 percent smaller footprint, 74 percent fewer cables and 57 percent less power consumption than competitive solutions, according to the companies. Klarna's QFabric-based data center was designed, installed and supported by Juniper Networks' Stockholm-based partner, IPnett, a supplier of communication and security solutions and systems integrator in all the Nordic countries.